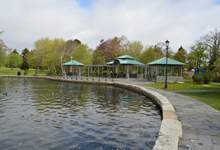 The City of St. John’s is conducting a series of integral public information sessions from March 27 to April 3 as part of developing a Parks and Open Spaces Master Plan. Five interactive Ward sessions will be held throughout the city to engage residents in the discussion about how green spaces and parks contribute to the neighbourhoods in which they live. *Ward Four session is now combined with Ward Three session due to the inclement weather on April 1. The public consultations will be conducted by Trace Planning and Design, internationally-recognized consultants with an expertise in community development and master planning. Recent projects by this team include the City of Moncton’s Recreation Master Plan, the Riverview Town Centre Plan and Stratford’s Active Transportation Plan. Trace will be utilizing Randall Arendt, the country’s most sought-after speaker on the topic of conservation planning and the driving force behind the Greener Prospects project (www.greenerprospects.com) for some of the upcoming sessions. Arendt is an author, lecturer, educator and site designer specializing in land conservation through more compact development design. He is the author of more than 20 publications, has designed conservation subdivisions in 24 states, and has lectured in 46 states and seven Canadian provinces. He is an honorary member of the American Society of Landscape Architects and a fellow of the Royal Town Planning Institute in London.